The Chinese University of Hong Kong Library Extension, Hong Kong, China, was recognised with a Merit Award for its design excellence at FuturArc Green Leadership Award 2016. The new library extension at The Chinese University of Hong Kong, designed by Aedas, connects the existing university library, Tin Ka Ping Building and the new school building across Library Boulevard. The extension functions as a connector to de-emphasise the old boundaries between the library and other facilities. 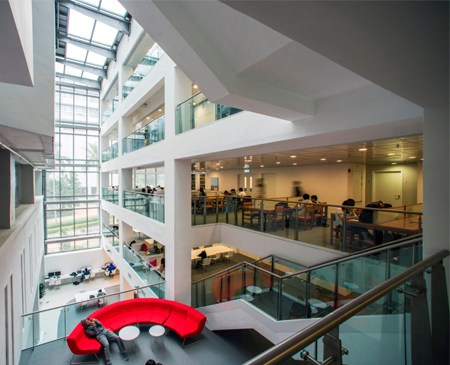 A diverse range of learning spaces is organised around the atrium, with discussion rooms scattered around the university library. Open spaces are provided near the discussion rooms. The extension also serves as a plaza, a welcoming space for learning and gathering. As the new library extension integrates seamlessly with various work, leisure and social activities, students can utilise the library and other resources in a more convenient and casual manner. FuturArc Green Leadership Award was launched in 2009 by the BCI Group of Companies and is organised by FuturArc Journal to seek out innovative and ecologically responsible buildings in Asia. The competition recognises the teams behind the superior design work to define what a Green building in Asia is.